Provide comfort for the family of James Locascio with a meaningful gesture of sympathy. 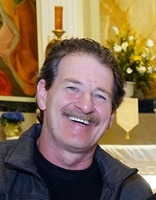 James J., age 52, February 1, 2019. Devoted father of John F. Locascio, Joseph Locascio and Melissa Petterson. Loving grandfather of Matthew, Joseph, Evelyn and GiaCapri. Son of the late John F. and Patricia Locascio; step son of Valerie Oakes-Locascio. Dear brother of Patricia Miller, John Locascio, Wayne Smith and the late Ellen Jobbers and Ann Esposito; also survived by Frances Locascio and many loving aunts, uncles, nieces, nephews and cousins. James was an avid fisherman and crabber. He also loved watching movies. He was born in Bayonne, N.J. and was a baseball umpire for years in the North Jersey area. James was an electrician and former member of IIBEW Local 102. Relatives and friends are invited to his viewing and funeral service Friday eve., Jan. 8th, 6:00 P.M. to 8:00 P.M. at Vincent Gangemi Funeral Home, Inc. 2232-40 S. Broad st. (at Wolf St.). Funeral Service will begin at 8:00 P.M.
To send flowers in memory of James John Locascio, please visit our Heartfelt Sympathies Store.